Hercules: The Legendary Journeys was a 60 minute fantasy series that aired in syndication. Hercules was the son of the God Zeus and a mortal woman. Zeus's wife Hera, upset over Zeus' indiscretion, causes Hercules to go mad and she also killed his wife and children. After regaining his sanity, Hercules decided to use his super strength to help mortals. He was often aided by his friend Iolaus. This series inspired the "spin-off" of three others. They were, "Xena: Warrior Princess", "Young Hercules" and an animated series titled, "Disney's Hercules". 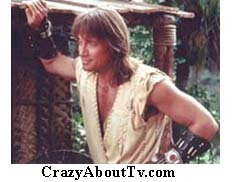 In College, Kevin Sorbo played on the baseball, basketball, football and hockey teams and also appeared in several plays. Prior to starring as Hercules, he spent three years travelling worldwide as a model and doing more than 150 commercials. He also worked as a bouncer for a while. He barely lost the role of "Clark Kent/Superman" on the show "Lois And Clark (1993)" by coming in at second choice after Dean Cain and was seriously considered for David Duchovney's lead male role on "The X-Files (1993)". The character "Autolycus" was also known as the "King of Thieves". He mostly stole from the rich and often gave to the poor. It is possible that he was the basis for another mythical character, "Robin Hood". In May of 1998, Hercules mother died and Hercules decided to go to Olympus and help his father Zeus rule over the other gods. He quickly changed his mind, however, and returned to Earth. Iolaus was Hercules best friend since childhood. In late 1998, Iolaus' body was taken over by "Dahak" an evil spirit. Hercules spent several episodes trying to "exorcise" Dahak's spirit from Iolaus' body and finally suceeded in January of 1999. Iolaus' spirit was released to heaven. A few weeks later, another Iolaus appeared (commonly referred to as Iolaus II) from another dimension and took the original's place as Hercules friend. In May of 1999 Iolaus II, after being transformed into a "Merman" went off to live in the ocean with his beloved "Nautica", a mermaid and daughter of Triton, god of the sea. The very next week the gods decided to bring Iolaus I back to life so he could return to Earth and to Hercules. "This is the story of a time long ago. A time of myth and legend when the ancient Gods were petty and cruel and they plagued mankind with suffering. Only one man dared to challenge their power...Hercules. Hercules possessed a strength the world had never seen. A strength surpassed only by the power of his heart. He journeyed the Earth battling the minions of his wicked stepmother, Hera, the all-powerful Queen of the Gods. But wherever there was evil, wherever an innocent would suffer, there would be...HERCULES." Thank you for visiting our Hercules: The Legendary Journeys page!